Have you been looking for a great deal on a foreclosure property in the Miami vicinity? Have I got a deal for you. Although this home was built two years ago, it’s like new as it was never lived in. It was purchased by an investor and he never lived in it or rented it. He was trying to flip it but fell behind on his payments and got foreclosed on. 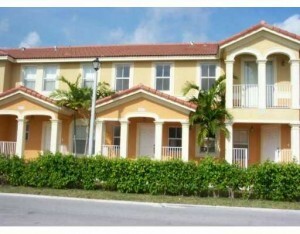 This great townhome is just blocks from the SW 112th Avenue exit on the Florida Turnpike in South Dade. The area has several brand new communities as well as some new schools to accommodate the growth. It is just minutes from Southland Mall, Target, Publix and many other shopping facilities and restaurants on U.S. 1. This foreclosed property has 4 bedrooms, 3 full baths, living room dining room and kitchen. One of the bedrooms and baths are downstairs for extra convenience. There is a fenced yard big enough for Fido and a brick-pavered driveway big enough for 2 cars. It is listed at the great price of $104,900. Unbelievable price for a 4-bedroom home! This same property sold for $262,900 when it was built back in 2006. Call today before it’s gone! 786.581.1517 Click here to see more details on this great property. This entry was posted on Monday, October 13th, 2008 at 10:21 am	and is filed under Priced To Sell, Southwest Dade. You can follow any responses to this entry through the RSS 2.0 feed. Both comments and pings are currently closed.